Helen Steel and Dave Morris care deeply about the oppression and destructive exploitation of people and the planet by giant corporations. Just like you. They have a vision of a society in which the power of the corporations is replaced with self-organisation and co-operation. A society in which we take control of our own lives, our own communities, our own workplaces. In which we make all the decisions that affect our lives and affect the environment. Where we decide what happens to the resources, and decide what needs to be done. Their active campaigning brought them head-to-head in court with the people who run McDonalds global empire, and more recently the British state. And they won. Dave and Helen are prepared to do anything it takes to defend the public's right to criticise multinational corporations. Franny Armstrong's electrifying new version of her no-budget 1997 documentary, filmed over 10 years, traces the day-to-day detail of the pair's epic struggle against all the tricks and pressures that a global corporation and the British legal system can bring to bear. Anyone who shares their concerns (and many who don't) will be moved and inspired by this 85 minute film and the 4 hours of additional material on the new double DVD . In 1986, Helen, a gardener, and Dave, a postal worker and single parent contributed to a London Greenpeace campaign leaflet revealing the extent of McDonald's exploitation and abuse of poor farmers and their own workers, the way in which their production processes misuse and damage the world's resources, the dangerous impact of the farming and food processing practices used in the supply chain, the resulting environmental degradation, the cynical marketing targeted on vulnerable children, and not least McDonald's false claims about the healthy and nutritious nature of their products. McDonald's weren't pleased. They sent undercover agents into London Greenpeace to spy on the campaigners. Sometimes there were more spooks than genuine campaigners at meetings. In 1990 writs were issued to Helen and Dave. Either they withdrew their criticisms and apologised or they would be sued for libel. Helen and Dave decided to stand up for what they believe. Unlike the majority of the British newspapers and TV stations they refused to say sorry. The McLibel case became the longest trial for libel in British history, lasting two-and-a-half years. Denied access to legal aid by the ancient and notoriously anti-free speech libel laws, and with no funds of their own, Helen and Dave were obliged to fight the case themselves. They soon attracted legal advice from barrister Keir Starmer, and a support group which raised around £35,000. Compare this with the estimated £10 million that McDonald's spent on its top flight legal team! By 1997 Dave and Helen had defeated McDonald's on 7 out of 11 counts. In February 2005 they scored a double victory against the British government in the European Court of Human Rights. 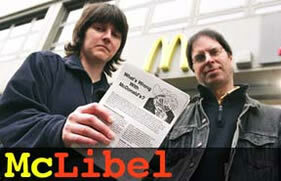 Having fought McDonald's to a standstill in the longest libel trial in British history, and the most important trial of the century, according to Michael Mansfield QC, the pair decided that no-one else should have to go through such an exhausting process. The European court's decision challenges the right of major corporations to sue critics for libel under English law, and the lack of legal aid for defendants in libel cases. The trial and the campaign that accompanied it stepped into a new gear with the advent of the internet. Using the then revolutionary new technology to sidestep the corporate media, a website McSpotlight, was set up providing global access to a permanent source of information about the trial and help in co-ordinating the ongoing campaigns. The success in court reverberated around the globe, unleashing torrent of criticism against the power of the corporations. Two days after the end of the trial a mass defiance day saw protests at hundreds of McDonald's outlets around the world. McDonald's profits went into a deep dive. They made their first loss in 2002. The refusal of these two activists to give in has fuelled a growing world wide movement to oppose corporate power. "If we remove corporations and governments who care only about profits and power and take things into our own hands obviously that's basically transforming society. That's revolution. Not just on a single day, over a period of years, building up strong grass roots movements until we can take over all the decision making ourselves and look after the planet." A World to Win proposes the practical steps necessary to turn this vision into a reality.